I am pleased to announce that we are now taking pre-orders for RainSaucers. The RainSaucers units will initially be on sale on a first come first serve basis (thus we recommend you pre-order) at San Francisco's Urban Farmer Store (2833 Vicente Street) later this month for $55 (a demo unit is already in the store). 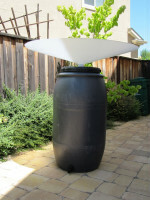 You will need to purchase a rain barrel as well and Urban Farmer sells them with rebates included from the SFPUC. For those outside the SF Bay Area, please feel free to fill out a pre-order form and we'll let you know when can be supplied to you locally or online.